These are personal reflections of our clients experience in their own words. We are deeply grateful for their willingness to share their honest experience. It is a gift. Thank you to all of you for doing it. Enjoy! “I was searching the web to find someone who could help me figure out if Colon Hydrotherapy would be right for the issues I was having. I reached out to Designed for Thriving and was pleasantly surprised to get a quick response and then a follow up phone call to find out more about the issues I was having. I was asked to fill out an intake of sorts so that they would have a better idea of how best to help me address my issues specifically. I was greeted on my first visit by 2 very warm, fun, delightful ladies! They were informative, gentle, kind and ever so helpful. We set out to find what to do for me and for my body. This isn’t always achieved in a once and done way. But, they gave me things to work on after each visit; which I was able to do easily and in no time the changes made were working Ever so Greatly! I have been to their office five times and have achieved the results and success that I was hoping for. Not only did we achieve this, but they want me to check in with them and talk about what is or isn’t working and also to make sure I don’t slip back into my old patterns – because it is so easy to forgot the good changes and fall back into old ways. Thanks much for EVERYTHING you both have helped me achieve! "I have had some major changes since I first talked with Cari about two weeks ago. As we talked about what was causing me to be "stuck in the past", I felt a pressure lifting from my chest. My desire to eat literally all the time was gone. I realized I did not need to eat between meals, and our meals 3 times a day are very balanced. That helped me to loose 10lb without any other change, no diet, or calculating calories, or starving myself. Another thing I have noticed is that I am eager to go to the fitness center 2x a week, and am not dragging my feet anymore. These are two very big changes for me and I find I like myself better and in turn can treat others with more kindness." "I know I just ordered a starter, but I love my pendulum so much! I have been working with it to open and clear my chakras and it’s absolutely amazing. I never knew I could have so much love and deep appreciation for a crystal. Thanks for choosing such a special stone for me and for teaching me about their amazing energy. I will continue to practice and learn." "I wanted to share results from yesterday’s session: By last night, the pain that I had in my back – which when lifting my left arm or bending or twisting had been enough to almost bring me to my knees, was gone. The pain in my neck – which had started right after Thanksgiving is also gone – ‘ the blackness behind and above my head’. Yesterday’s session truly made a difference in my life. Last night I finally realized the power and strength of the mind and the expanding of heart over matter, the power of meditation and truly trusting what I hear, what I feel in my heart, trusting in what I do know and embracing it all. I feel the strength and support from Grandmother and Seed. I am tearing up just thinking about it. I want to thank you for helping me." "Had yearly eye check up yesterday without glasses. I could see three lines lower on the chart. Good news! Keep up the good work and will be better in a year. Can’t believe the improvement. It’s been four years since this started with my eyes. Also the eye doctor said I have cataracts but don't need surgery yet. It's a lot different since last year he wanted to do surgery." “Cari Wright is a knowledgeable, gifted and dedicated practitioner. Her service for myself and my family has been insightful, uplifting, positive, and transformative. I'm profoundly grateful that her unique talent and knowledge is available for the benefit of others. Most highly recommended”. "I met Cari at some classes we attended together in Atlanta. She has an amazing gift. My girls wanted a stone when they saw one I had gotten from her, and Cari did a reading also. When I got them back, I thought WOW!!! All I had given her was their name and birth date. If I had any question before about the stones, those readings removed all doubt. I feel privileged to know her!!!" 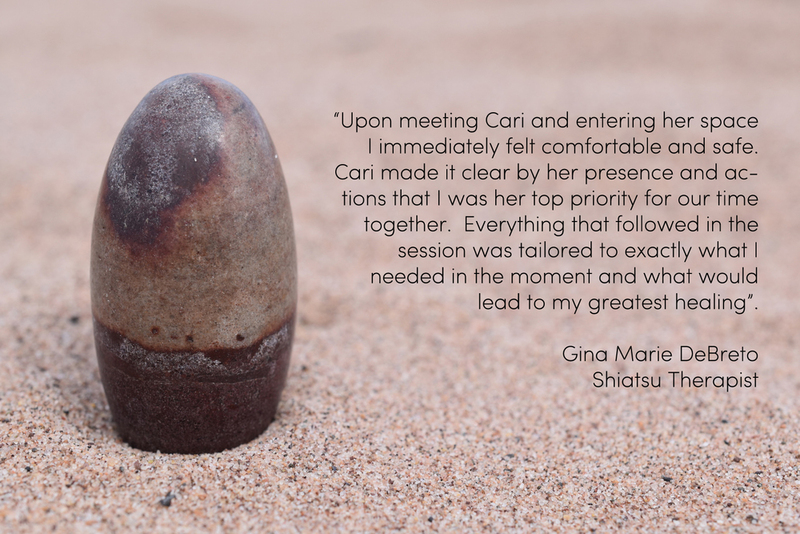 "Cari was recommended to us when we were searching for cranial sacral work for our son. We appreciate her vast knowledge; she is caring and intuitive. She has helped us achieve relief of new and old stress or grief and physical body pain. The experience with our son led to work with me (mom). Through Cari's many skills, both of us have achieved a better balance and have become more mindful of our needs in our aspects of health - emotional, physical, spiritual, environmental, and intellectual. This balance has improved our household relationships and has empowered our son to seek his balance and for us as parents to be more aware of who he is and what he needs." "Cari is a gifted healer. I've been Cari's client for almost two decades and I have not found her equal in any other bodyworker or therapist. I am a logical thinker who is analytical and skeptical by nature. Cari has made a believer out of me on numerous fronts. In my experience, she has a unique talent for combining modalities and tuning into my precise needs. I come away from every session restored not just physically, but also on a deep energetic/spiritual level." I just can't say it enuf - your stones are SO beautiful. I just cherish every single one I've brought home with me, and will love sharing some of them with my loved ones. “Wow! Cari has taken my over all health and healing potential to the next level. As a Physician Assistant and Nutrition Response Testing practitioner it has been very difficult for me to find someone who has the knowledge and understanding to help me tweak my healing journey to maximize my overall gains. Cari's experience combined with her medical intuition is what sets her apart from the rest. The best part is that I can work with her from the comfort of my home via Skype and email. I am now pregnant with our fourth baby and I'm looking forward to my healthiest pregnancy yet! "The mineral kingdom has truly come to life in our home near Charlotte, NC. I will be forever grateful for the time Cari has spent with us to help guide my oldest son through a healing process. Her work has inspired me to let life flow as it’s meant to be. The effectiveness of our combined work has been so exciting that there is a healing alternative. Our 14 year old son suffers from a form of mental illness and through the healing properties of stones we are recognizing the power that goes beyond the beauty of a rock. I am seeing a bond I have not seen with my son, treating his stones as new friends. It is so exciting for him to have a ‘companion’ that helps encourage him to find his way through difficult situations. He has recognized a shift in his energy and self-confidence and is beginning to recognize the hope in healing. He sleeps with his stones, one to which glows brighter when his commitment is stronger within himself. It’s a very proud moment I experience when I peek in his room and see a very bright glow, I become reminded that healing is taking place! I am a true believer in the work that Cari has been called to do and look forward to sharing this hope with those that are willing to open their minds that true healing exists!" In late January of this year, my horse, Tapper had a terrible fall and injured himself. No one witnessed the event. I called our vet to see him and in her exam she felt he probably had a crack in his pelvis. Both his lower and upper pelvis were smooth and normal, but she felt he probably had a crack in the region that sticks out – a area she couldn’t x ray at the time and impossible to feel externally. Our vet said his injury would take a long time to heal. When she came about a week ago to do spring shots, she was not pleased with his lack of healing. That same day of spring shots, I had Cari Wright examine him. I was quite emotionally upset after my regular vet’s exam because she confirmed what I was already feeling – he should be much better by now. I believe Cari Wright has a gift of healing from God. I say this because I was right there and witnessed it myself. Cari carefully listened to me and Tapper about his injury. She then quietly, gently laid her hands on his injured pelvis area. This area has been incredibly painful and sensitive to Tapper. Even when I brushed him I’d take extra care because I could see it hurt him so. Cari was gentle and direct with me too – I was an emotional wreck, and she told me I needed to be The Mom and toughen up and lead him to healing – make sure he was getting the rest he needed and extra vitamins/minerals in his supplement. She had me give him 2 ½ times the amount of supplement – so his body could heal. Cari focused her healing energy on his pelvis and then lower into his upper leg region. She had me put my hands on him too and I could feel his muscles contract under my hands. Between the power of her healing hands, prayer, and focused optimism, I’m happy to say Tapper is MUCH better! Cari saw him 9 days ago and I am so astounded by his healing. Today I watched him at a distance, and for the first time in several months he was standing almost square (putting weight on his back leg). He hasn’t done this in a very long time. He doesn’t stand square constantly, but he did it several times within a couple of hours I spent with him today. I also applied some DMSO to him – like Cari said I should – that seems to be helping too. I am still taking Tapper in for x rays – I want to make sure I’m not missing something, but I feel very optimistic and hopeful for our future together. Tapper means the world to me. I also plan to continue to have Cari see Tapper before we go for x rays and when we return. I’ve been witness to the gift of healing God has given her, and put my faith, hope and trust in Cari. I’m doing all that I can to make sure Tapper gets the best care possible. Cari Wright is a huge part in this healing process – for both Tapper and myself. “From the first telephone conversation that I had with Cari, I knew there was something special about her. Cari is an intuitive – a soul of all ages. Her knowledge is abundant, her wisdom is boundless, and her spiritual being is radiant. Cari’s willingness to share skills and knowledge with others is truly a gift to us all. Whether taking a class with Cari or visiting her shop, you will have an opportunity to learn about yourself, opening your mind, body and soul to your higher self and through loving intentions, find that each and every one of us can make a positive difference in this lifetime. "When we came to see you, we weren't sure exactly what to expect. You made both of us feel comfortable, and relaxed. You did a good job of explaining what your role is, and how you would work to help us/myself. You identified what my body needed, and made recommendations that made sense to me. When I started taking the products, I did notice a definite improvement. In fact, a few days ago I noticed a return of symptoms but were not as severe nor lasted very long. Thank you." "During your webinar (that I could not be present during the live recording), I wish I could express how much your words penetrated my soul. I would LOVE to share this with you. You see, Isaac had been admitted to a Behavior Health hospital for observation for 5 days and my world was spinning out of control. The medical doctors wanted to push medication on him and I was fighting against the medical community tooth and nail. Not one person was on my side, except Isaac, the one who mattered, but yet, he was given a recommendation for the state mental facility, and it was out of our hands. They had full control over sending him to the place of their choice, I was left so confused. Things were quickly falling apart. (He left the evening of your Webinar.) I hurt SO deep, Cari. I carried such a weight that I could never put into words. I associated this feeling to that of a fearful heart, with a reminder that when I experience fear, there is a message I need to listen to. I sat in our recliner, sobbing with my computer, awaiting the webinar recording to load. Tears streaming, complete blockages FILLED my very being. I have believed in your gift to the pits of my soul and knew it was meant for me to listen in that very moment. The Holy Spirit had me wrapped, drawing me so very near. My blockages were starting to fade, recognizing joy and gratefulness. The flow was, in fact, returning. When you asked which spoke up, Grandfather or Mother, I felt a sense through my heart Mother pointing me to Grandfather. Grandfather offered me such peace especially with the words he spoke. He became more alive with his message to me and I begged DO NOT LET ISAAC GO. 4 days later, Isaac’s recommendation lifted, he was “allowed” to return home while awaiting the opportunity for the Holistic Treatment Center, New Hope, that we are waiting to send him to. I was overcome with great joy and peace. The Friday night he returned, his one rock was glowing SO bright, excited for his return. He loves his rocks and brings them with him wherever he goes in our home when he recognizes his sense of calm. He knows when his energy is excessive, he protects them by keeping them on his bed, so they don’t break! He tells our family he has the most valuable thing in our entire home! I can’t wait to learn more and more! We are grateful to see the purpose of a stone coming to life, reminding us of our wholeness. We hope to see him off to New Hope before summer. This opportunity is huge for him and look forward to allowing life to flow the way it is intended." “I almost never get sick. In fact I can’t even remember the last time I was sick......because of this I never thought that I would ever volunteer a testimonial to a website for healing. But here I am, and I had to do it. I have been utterly blessed to watch Cari Wright grow as a person and a health practitioner over many, many years. She is one of the few people I know who truly lives what she is offering and believes. That is so so extraordinary, that we ought to ALL go out and participate in the compassionate, glorious care that she can, and does, offer us. What better investment could there ever be!!! I have felt this for a long time and now is the time I want to say it—to share it with the world, because I think it is so crucial, but also because not too long ago, I DID get to directly participate in utilizing Cari’s glorious healing gifts. I live in New Mexico and in the summertime, it’s the season for wildfires. We come to expect it. This summer there was a huge one, only THREE miles north of our mountain home & office. While I was very blessed that the fire went in the opposite from us, the smoke was not so contained. It was everywhere. It permeated everything completely and how can you get away from it? You can’t. I woke up the morning after the fire started with the first headache and stomachache that I had had in decades. I literally didn’t know what to do. I was so affected by the smoke that I was completely ungrounded. I couldn’t think. I couldn’t get my sentences to connect and I couldn’t even BEGIN to know how to be coherent and ready for a very busy workday, let alone my life. Finally it dawned on me: Call Cari. Of course. She immediately suggested several different supplements based on what I had at hand. She told me what to eat and drink and how everything she was suggesting would actually affect my system. I love that! How else am I going to partner in my own healing (absolutely crucial), especially when I was so discombobulated. She precisely and easily walked me through all of it. Then she also told me what she felt was the underlying cause as to why I was so susceptible to the smoke and its effect, at the core. Spot on. Wow! I knew she was right. By the end of the day, I couldn’t even remember the headache and the stomachache, but I definitely remembered what I was healing in my mind, heart and body, and I was able to utilize the smoke as an ally in TRUE healing. “Upon meeting Cari and entering her space I immediately felt comfortable and safe. Cari made it clear by her presence and actions that I was her top priority for our time together. Everything that followed in the session was tailored to exactly what I needed in the moment and what would lead to my greatest healing”. "It was great to meet all of you. The experience that I had while in your shop validated that certain signs that have been showing up are piecing themselves together. It is truly amazing. Thank you."